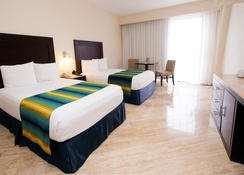 Crown Paradise Club Cancun is an all inclusive luxury resort in the easternmost part of Cancun. Boasting a lovely beachfront location, the hotel has separate family-friendly and adults only areas. Featuring over 600 well-furnished rooms and an exciting water park, guests are sure to have a splash-tastic time at this luxurious property. There are six a la carte restaurants and one buffet-style venue serving up regional and International cuisines. All inclusive guests enjoy access to the Nitro club with drinks and exciting water sports. 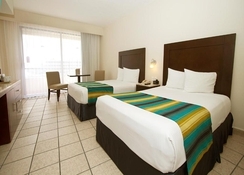 The hotel provides numerous avenues for having fun—from an activities pool, a jacuzzi, mini golf, spa, kid’s area, a family games area and bar in the water. 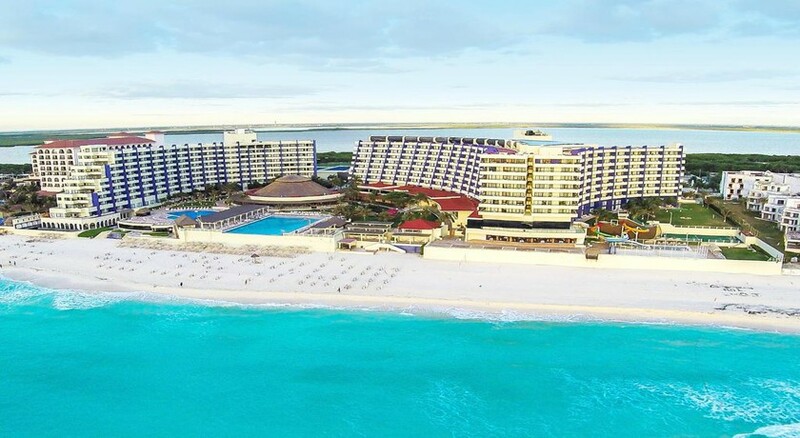 Crown Paradise Club Cancun is within a short walk from Cancun attractions like Avenida Kukulkan, Playa Delfines and Doplhinaris Park Riviera Maya. Just three minutes away from a gorgeous white-sand beach on the Caribbean Sea, it features a water park with eight thrilling water slides. Aqua World Marina is 3.5km from the hotel. The Cancun International Airport is 18km. 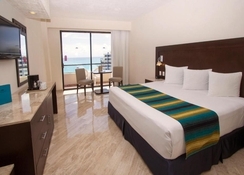 At the Crown Paradise Club Cancun each room is spacious and offers a balcony with lovely ocean views. All air-conditioned rooms are designed for the relaxation and comfort of guests and come with King/Double beds, satellite TV, coffee maker, minibar, safe and refrigerator. 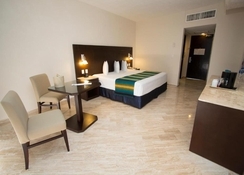 The hotel features 336 standard rooms, 32 rooms in standard plus room, 24 family rooms and 113 special suites. There are also nine honeymoon suites to provide the ultimate romantic experience with jacuzzi on the terrace. There is a hospitality room for early check-ins/late check-outs. There are six a la carte restaurants at Crown Paradise Club Cancun which include La Palapa, for Italian, Oriental and Vegetarian options, Fujiyama for an Asian-inspired menu, Sans Soucis serves a'la carte French cuisine, Los Gallos for a la carte Mexican, Fisherman's for fresh seafood, La Piazza is for its delicious Italian snacks and Wayne's Boots for various meat dishes. There six bars too, which serve alcoholic and non-alcoholic drinks including the Club Caribe Pool Bar and the Beach Bar. All-inclusive guest can access Nitro disco club, (drinks included) until 2am. 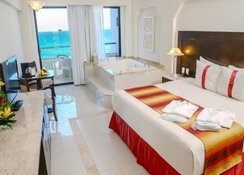 Crown Paradise Club Cancun features a spa, poolside massages and hot tubs - ideal for guests who wish to unwind. There are many free on-site activities, like a mini-golf course with 18 holes and games room which has billiards, ping pong and table soccer. For kids there's a Mini Club and a play area with games. 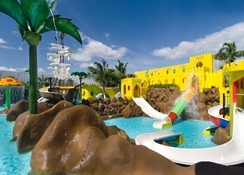 The teens can have fun at the waterpark and Pirate Ship. There are also two tennis courts and a gym. In addition, guests can enjoy non-motorized water sports. An excellent hotel for children and couples. The staff are very helpful and friendly. The barman, who works in the adult pool bar, works tirelessly. The rooms are cleaned daily and the cleaner makes animals with the towels. Food choice is great and there’s a choice of restaurants to choose from too. I had a great relaxing holiday there. We found the hotel very clean,staff were very welcoming and friendly especially geronomo in the buffet.Jesus our bell boy was very helpful as well.Would certainly go back again.